My Orange Brompton: Brilliant Mudguard Solution for your Brompton! Some of you may remember my woeful blog post in which I attempted to spray paint a set go mudguards orange - CLICK HERE. This was such a terrible experience I still wince when I think about it. You may well remember that I bought an orange chain guard from Tiller Cycles last CLICK HERE and this orange chain guard is still on my Titanium Orange Brompton. 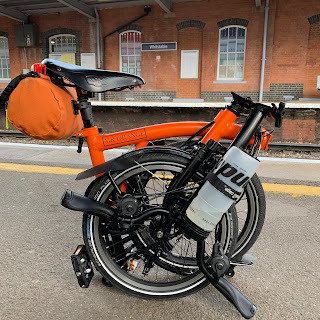 I didn't actually realise that Graham at Tiller Cycles had been working away on mudguards and it would seem that he has produced a great solution to all those who want to either colour coordinate their Brompton or go for something totally different. The first thing I noticed when I opened the well packed box was that the mudguards were made of aluminium and not plastic. They really are a quality product with no rough or unfinished edges. The paint match is spot on and you can get the mudguards in all the existing Brompton colours with the new 2015 colours to come in the near future. As far as weight it concerned they are a little heavier than the standard plastic ones but there is only a few grams in it and therefore nothing to be concerned about. The front is 23g and the rear is 28g. There are a few options available when buying them. You can buy just the mudguards and use your existing metal stays or you can buy them with steel and even titanium stays. Graham enclosed detailed instructions on how to fit the mudguards and this was a fairly painless process. Believe me, if I can do it anyone can. Seeing orange mudguards on my beloved P type was a gleeful moment. It is something I have longed for ages and I have to say I was very pleased. I have suffered a few cracked mudguards in my time and these are definitely more robust. The fit is perfect and as good as the original Brompton plastic mudguards. I don't know how the paintwork will fare over time however I suspect all should be okay. They are powder coated and I haven't asked Graham at Tiller Cycle yet but I would think Brompton touch up paint might cover any small blemishes. These mudguards are hand made and as such made to order so expect to wait 3-4 weeks for yours to arrive. As far as I am concerned this is more than fair. The prices can be found via the Tiller Cycles website and I have placed a link below that will take you there. I am very happy with these mudguards and sure that lots of you out there would be too. I know that lots of Brompton owners like the idea of colour coordinating or want to mix and match but it has not been possible...until now. Even thought I have put them on my P type I have a strong feeling I will take them off to put on my Titanium Orange Brompton instead. Of course I may well buy another set and have both bikes kitted out in orange mudguards! next upgrade... SON dinamo orange?? You want fenders to be moderately easy to break, especially the front one. That way if something gets jammed in like a large stick, hopefully the fender breaks releasing some of the force so you don't fly so hard over the handlebars. Hopefully they break in a way you don't have to fly at all. Most bikes have settled on plastic fenders and away from aluminum and other metals for that reason. Just cracked my front mudguard due to an overenthusiastic fold! I knew about Tiller Cycles, but thanks for the tip - have just paid £1 deposit towards a pair in Cobalt Blue. Don't know if you ever read the comments, but did you fit them yourself? How easy is it? I'm reluctant to try anything on my Brommie as it all seems to be machined to within mm tolerances!